Birmingham hosted the Cycle Ride for Ovarian Cancer and my friends and I were there to honor our dear friend, Sherri, who is now in remission! After many grueling weeks of chemotherapy, Sherri can now say that she is cancer free...and that sounds wonderful to all of us. I made a paper doll "Sherri" for each of the bikes as an incentive to keep on going! The group of us were made up of Carole, Sharon, Cathy and me...and, wearing the scarf is our beautiful friend, Sherri! She named her group the "Rainbow Riders"...so we honored them by wearing our rainbow ribbons on our teal "Team Sherri" t-shirts. Amazing what a little black glitter and glue can do! ...and the reason that I was so inspired. The demolition continues downstairs. Yesterday I had two men ripping up the remainder of the carpenting and then scraping the flooring under the carpeting. Now the room is back to just a concrete floor. At the same time, there was sheet-rock work being done in the bathroom and laundry room. The more they sanded...the more dust that was kicked up. (ah-choo) I can't wait for this all to be over with! Off I went yesterday to go through countless wallpaper books in search of the "perfect" paper to replace what was destroyed lovingly hanging in my downstairs bathroom. I ended up lugging home three huge wallpaper books to check out some that I thought might work. After a while I finally set my sights on one particular pattern that was really pretty perfect for the room....only to find out today that it has been discontinued! I seem to be known around here for my homemade oatmeal cookies...so,it isn't unusual for me to whip up a batch at any given moment. Well, I was told that they would be here in the morning...but, by 4:30 this afternoon, no one had shown up! Looks like Dave and I will be enjoyed some freshly baked oatmeal cookies this evening! The verdict is still out as far as Ellen as the new judge...but, there is no doubt that Simon is in his usual "tell it like he sees it" no-holds-barred mood. You have to feel sorry for some of those kids that he lambasted in a mean-spirited way the first two nights this week...He could be so much more effective if he could say the same thing in a kinder, more helpful way. I have really enjoyed watching the Winter Olympics this year. Vancouver is quite beautiful with so many incredibly breathtaking sights. Dave teases me, but I really love all of the cheesy inside stories on the athletes. It keeps me interested as I watch the competitions...not only physically, but emotionally. Speaking of the Olympics....Apolo Ono is getting ready to try for another medal in speed skating so I am heading downstairs to watch! He's so exciting to watch as he maneuvers his way around the other competitors at the last minute and manages to place almost every time...hopefully, he can do it again tonight! I hear the people get so attached to their Subaru cars that they name them. Anyway, I took Subie 2 out for a spin today and it was great fun! It felt nice to drive a car that didn't shake and vibrate whenever the brakes were used. And, the smell....Ahhhhh...new car smell. Guess what's sitting in my garage tonight??? ....It was a long day..... ending with very good results.......as I surprisingly sold my Jeep to one of the workers who arrived here today to begin the "flood" clean-up and got a lot more money for it than I would have on a trade in....enabling me to take advantage of a great end-of-the-month deal on my new Subaru Forester. Sometimes the Universe sends out signs to me. Before you put me away (! ), let me explain...This whole "car journey" has been interestingly played out in a way that is making me think that it was meant to be. Tossing and turning all last night, I began to think about whether to buy this car (see yesterday's post) or not. It would be the first big buy that I would be doing on my own since being divorced nine years ago and I feeling was quite anxious. It was at that point that I began to think about all of the positive signs that were being sent my way. First was the timely phone call from the dealer that I had already spent some time with several months ago when I started to look at getting a new car. I test drove the Subaru...liked how it drove...but, had some concerns about the colors of the cars in that style as well as the interior. But, I was only able to look at the little swatches in the brochures and, the one car that they had on their lot....until yesterday...when I went....and, I found myself drawn to the sage green car in the showroom ....a color that I hadn't seen before. And, this particular car had everything that I ever wanted or needed in a car. It was pretty much made to order for me. Prior to going there, I was having my hair cut and got into a discussion with the owner of the shop about Subaru's. "The best cars made!" he exclaimed, "and I have owned much more expensive cars....but, I absolutely love my Subaru the best!" It turns out that several of his family members drive Subaru's and wouldn't trade them in for anything but another Subaru. Also, two of my dearest friends owned a Subaru that they affectionately named "Subie" and had driven it for many, many years...hating to ever give it up. Coincidentally, this morning's paper had a small article by Consumer Reports touting two makes of cars that won their highest praises....Honda and, yep, Subaru! In thinking about the Forester, I also realized that this car is really perfect for me....it isn't fancy with lots of bells and whistles....it is comfortable, safe, and cute. It is just a good basic car...nothing extravagant...and not loaded down with a bunch of stuff that I really don't need. Simplistic and practical....kind of like me. Granny Annie said... You have already found a place for it in your budget. You will worry if you buy it. You will worry if you don't buy it. Buy it and drive safely with a free two year maintenance agreement. WhooHoo! Thanks, Granny! I loved your comment... it made a lot of sense to me and was another sign for me this morning. .......and buy the car today..
To buy or not to buy.....that is the question? My 1999 Jeep Grand Cherokee is getting ready to need some expensive repairs including new brakes and rotors...and, it is a gas guzzler!! The Subaru dealer has the car pictured above ready to sell. If I were to buy it before the end of the month, I could get a great deal on it. But, I am petrified at the thought of making this huge purchase! Oh, what to do? 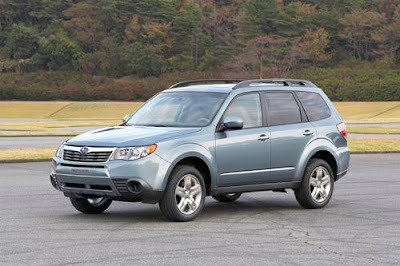 The car that I am interested in is the Subaru Forester....a small SUV with top safety ratings...and great gas mileage. It is smaller than my Jeep yet it has lots of room for cargo....including my pottery stuff. It isn't an extravagant car....but, it is certainly car enough for me. I could tweak my monthly budget to make room for a car payment. It is probably smarter for me to do this now before my older car begins to need major repairs. If I purchase it before the end of the month they will throw in free maintenance for two years. It all sounds good....BUT....I just don't know whether or not to make this commitment at this time. I love getting comments from my blog readers! While most of them are a positive, this particular one had another point of view on my take on Tiger Wood's public apology. It is a source of amazement to me when people are quick to congratulate someone for telling the truth. My amazement takes two forms: wonder at how surprising and refreshing it's become to hear anyone in public life speak honestly, and regret that "honesty" long delayed and by no means convincingly expressed is so quickly accepted at face value. I so appreciated these comments...it's nice to hear other thoughts on my topics. I still stand by my original feelings, however. My intent wasn't to "congratulate someone for telling the truth"...nor did I accept "at face value" all that Tiger said. The real theme of my post on Tiger was to say that I felt compassion for the man and hoped the best for him and his family. To hear him speaking (in my opinion) so humbly in front of his family, friends, and the world, did touch me. I felt like it took a lot for him to do that....and for that effort, I applauded him. I do expect people in public life to always speak honestly...however, I do understand that we are all humans, and humans can make mistakes. Taking responsibility for our mistakes is the very first step for growth and healing. Not blaming others for our misdeeds is the ultimate in being accountable for our wrongs. I felt that Tiger took full responsibility for his actions...and, I respected that. I definitely do not condone what Tiger did. I was extremely disappointed in him...and, especially concerned for all the young people out there who looked up to him as a role model. But, most importantly, I also believe in forgiveness. I was pretty amazed at how sincerely repentant he was. This "giant" of a man was so humbled as he stood before a small crowd of family and friends (not to mention a huge television audience!) and poured his heart out. He continually apologized for his previous, and hurtful, actions. Actions that he said caused people to stop believing in him. He said that he thought that there were different rules for him because of his fame and that he became, "entitled". But, now, through therapy and introspection, he not only knows better....but, wants to live better. As tears welled up in his eyes, he spoke honestly about his wrongs...and totally defended his wife and the things that the press has been accusing her of. He wanted to set the record straight...and, in my opinion, he did this and so much more. I see a broken man who is working as hard as he can to put his life back together and heal the pain that his actions brought on the people he loves...not an easy task. I can't help but respect him for attempting to win back the trust that he lost. I, personally, wish him the best. I have an "Owen and Audrey" original! This acrylic on canvas painting was created by two of my grandbabies....arrived in my mailbox the other day.......and I absolutely love it! Wednesday is "Senior Day" at my local Publix Supermarket. If you are over 60, you get 5% off of your total bill. So, as a 61 year old, why not try to take advantage of that day and its savings? As I drove through the overflowing parking lot, I saw that it was pretty much filled....full of old geezers...just like me.....I joined the fray as I grabbed the eco-friendly shopping bags out of my car and headed in. I hate to be critical, but I began to realize that old people move very s-l-o-w-l-y...pick out their groceries very s-l-o-w-l-y...and, talk with everyone in sight s-l-o-w-l-y. Of course there are advantages to shopping on "Senior Day": I actually felt kind of spry as I zipped around the aisles past the slower shoppers; I saved $3.15 on my $63.00 total bill (woo hoo); I had to show the clerk my id as she didn't believe that I was over 60 (flattery or just what they were supposed to do? ); and, last, but not least, there are an overabundance of bagboys ready and willing to take your groceries to the car for you! Jeffrey and Janet sent me some pictures of their neighborhood in Maryland (just outside of D.C.)....I'm not even sure if this was before or after the second blizzard that hit a few days later...nonetheless, this is what real snow looks like as opposed to the "dustings" of flakes that we tend to get down here in Bama! The rooms are dry and the machines in my basement are gone! Ahhhhh....peace and quiet and no blown fuses. The other good news is that the plumber may actually get here sometime tomorrow! The sooner the better in that I will finally be able to do laundry and stop skimping on toilet paper(too much information?!). We were supposed to have some snow again in the middle of the night...but, it never materialized. That happens a lot down here. That being said, we did get some cold rain overnight causing a little icing on the roadways. There were fender benders going on all over the place during rush hour this morning as the temps continued to drop into the 20's...We Southerners just don't know how to navigate winter precipitation...that's for sure. In the meantime, Janet, in Maryland, and I laughed over the fact that she couldn't get over all of the clamor about a dusting of snow here....while she and my son still have 3 feet of snow outside their door....And, that Jenny and Adam in Minneapolis are probably laughing at the people in Maryland and D.C. making a deal over their snow when they live with many feet of snow all winter long into the spring! Love the ice skating part of the Olympics. It is so graceful and beautiful while technically challenging. The good news is that the nurse told him today that she is doing quite well and should be moved out of intensive care and into a regular room today. They are even getting her to sit up already and will soon try and get her to do a little walking. Off to shower...Mah Jongg game over here today! ...that, and a dozen beautiful red roses and a teddy bear! ...and, don't forget the pink heart-shaped pancakes! Because of the frigid temperatures that we have had around here, I have been doing my daily walking inside on my treadmill...but, today, even though the temperatures are still quite low, I decided to get out of the house and take my walk outside. Walking is, and always has been, a great way to clear my head and get my thinking back on the right track. As I left my flooded basement with the cut-out carpeting and walls broken away....with the water stained floors....and the de-humidifiers and fans buzzing noisily...I began my walk. The now diminishing snow of yesterday was still quite beautiful as it glistened in the bright sunlight. There were traces of snowmen that had been built the day before...but, were now slowly losing their shape as the sun beat down on them. I could just imagine the neighborhood children joyfully scooping up handfuls of snow as they took advantage of the schools being closed early and the white stuff filling their lawns. After all, it isn't that often that we get snowfall down here in the Deep South! As I walked up and down the rolling hills that are my neighborhood, I began to relax and appreciate the beauty that surrounds me. Like the snow, some of my stress was beginning to melt away...and it felt so freeing. ...here I am walking briskly through my neighborhood breathing in the fresh air. I am still of sound mind (questionable?!) and body. I am surrounded by incredible friends and people who care about me. I have the most wonderful family...though scattered around the country they may be. So much love and joy. it provides me with warmth....it is a haven away from the craziness of the world around me...it is filled with wonderful memories of years gone by...and, when I am away, I am always so glad to be back HOME to my wonderful house in my purple painted bedroom....in my own bed with the letters D-R-E-A-M on the wall overhead. It is showing its age, that is for sure....BUT, like me...it still has a lot of life left in it...with new memories to make... and more joy to feel. I am trying to remember to "breathe" today as the "fun" just continues around here...(please note sarcasm here). After showering yesterday so that I could head out to the grocery store (to get the "mandatory" bread and milk in anticipation of our snow event! )...I again found my basement and laundry room flooded!!!!!!!!!!!!!!!! After making all of the necessary phone calls....the plumbers couldn't come until sometime today....but the company that dried everything out last time was able to get out here and set up their machinery...once again. The story should end here with my going to bed and having a good night's sleep...but, it was not to be. Unfortunately, some of the heavy equipment caused my power to go out...including my phone lines! Remaining calm (ha! ), I found my one working flashlight and tried to find my way into my dark basement and the fuse boxes. Now, I must tell you that my flashlight gives off about a millimeter of light...so, this was not an easy task. I finally had to give up and call the gentleman back to the house to help me get my power going again. By this time I decided to just unplug the machines and call it a night. Go buy bread....here comes the snow!?!? Grocery store owners are smiling. The local weathermen are excited. The sand trucks are on ready-alert. School children are dreaming of a day off from classes. Everything that I did or touched went wrong. Starting with the flooded basement, I began to notice a pattern in all that was going on around me. So, I did what any able-minded person would do......I began to panic! Then, I decided to bake some chocolate chip cookies for a friend who had us over for the Super Bowl. I make these cookies all of the time...but, this time I decided to try another recipe. The cookies came out awful....totally flat, like pancakes and slightly burnt around the edges and raw-ish in the middle. I went to get the mail out of my mailbox late one night in the dark. Instead of grabbing the mailbox opener, I put my hand around my thorny rose bush that encircles the mailbox. Ouch! While loading some photo CD's on my computer, my knee hit the tray that holds the CD and it totally broke off. Since it was a brand new computer, I knew that it would be covered by the warranty. After speaking to technician "Rajeesh" somewhere in India for quite a while, I found out that the warranty would not cover it because it was the result of an accident! I could go on and on....etc. etc. etc. etc. etc. I am now looking for a remedy to rid my house of this negative energy! ....It's time to share some pictures and thoughts about the Susan G. Komen Race for the Cure in Florida! Olivia Newton John (a breast cancer survivor herself) was the guest of honor! Here she poses with her (cute!) husband! She looked great and was very gracious! The first picture below looks like I am leading the pack of walkers....but, truth be told there were many, many more people in front of me than behind me! 2. )Still working on only 2 hours sleep, good sport Dave takes part in the walk, too. Here he is walking along the water in beautiful West Palm Beach! 3. )Of course, Karen's dog Baylee had to have a race tshirt too! Dave walked with a pink sheet pinned on his back in memory of his sister, Kaye. This made the walk very emotional for him...as it has only been a couple of years since she passed away from stage four colon cancer. Mom celebrated her youngest daughter's 10 years of survival on her back....and, I wore the names of my sister, Karen, and my friends, Carole and Sherri--who are both braving their cancer treatments right now. The most touching part of the entire day was the "Survivor March". This occurs after the races are completed as all breast cancer survivors line up and walk through the crowd together. The first photo shows my sister, Karen, and her co-chairman for the Race next year heading to the line-up of survivors. Another shot of my three sisters, Mom and me as we all gathered to show our support to this great cause. ....heaters, dehumidifiers, and powerful fans down in my basement this morning sitting on flooring that was exposed after part of the carpeting was cut away! It will be interesting to see what today will bring as I await the insurance adjuster and the work crew to finish tearing up some of the soggy mess down there. Messy, expensive, and time-consuming things....but, "things" nonetheless. As I got ready to leave my house this afternoon I noticed water in the garage. Checking things out further, I found that the laundry room was flooded as well as the bathroom in my studio....and the carpeting was drenched. I immediately did two things...called a plumber and called my insurance company (the third thing that I did was to open a bottle of wine) !!! Who knew that when I woke up today I would be sitting here tonight listening to pieces of wall being removed while carpeting is being ripped off of the floor??? A Tickled Pink Potty Party! As soon as I arrived in Florida....the "pink"ing began. One of the first steps was to decorate the port-o-lets for the Race for the Cure. These "potties" are "purchased" with a $50 donation to breast cancer research and decorated to the hilt inside and out! They are later judged and given prizes in various categories. Of course, my sister, Karen, already had her creative ideas for her two potties....so, we got to work. My other sister, Sherri, was in charge of the whole potty deal...so, it was really a family affair. Many of the potties were humorous....while a few were put together to honor a loved one with cancer and were more serious. Of course, no contest can be complete without trophies for the best potties! My wonderfully creative sister, Sherri, made these plunger trophies for the winners! Four sisters and a Mom! "Other things may change us.....but, we start and end with family."